Starting at $17,895, the 2013 Subaru Impreza is a customizable vehicle that promotes engine efficiency, partial zero emission and a fun ride for drivers. The new Impreza is able to handle anything that nature and drivers give it. With all-wheel drive, all four wheels are given the power they need to combat all terrains and harsh weather. It also has a vehicle dynamics control that will consistently monitor the cars braking, steering, and trajectory. Safe drivers will fall in love with the constant availability of driving in any condition while keeping on course to their destination. We were recently lucky enough to take the Impreza on a test run through the city streets of Philly, as well as the hills of PA. The Impreza’s design compliments its engine with a sleek look and powerful drive. The engine is an all-new 2.0 – liter Subaru Boxer with a lower center of gravity to improve control in the sharpest of turns. It also gets 36 highway miles per gallon, ensuring a carefree drive without having to worry when the next gas station’s going to come around. According to the Subaru experts we talked to at Reedman Subaru in Langhorne, there are some nice revisions that have been given to the Impreza for the 2013 model year. The interior has been refined in the Impreza to ensure comfort ability and safety. Features include a Bluetooth hands-free phone, an available premium audio system with iPod port, and GPS navigation for all the road trips that a driver would want to take. For the adventurous and sporty types, the Impreza also has optional roof rails and 65/35 split-flat-folding rear seating to extend cargo. With a bigger space for life’s necessities and the fun, it’s easier to travel and experience the outdoors like never before. 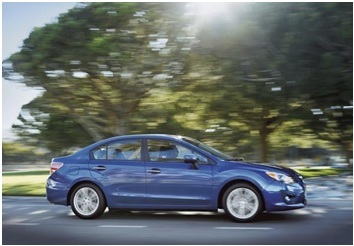 The Impreza is perfect for one night or a weekend getaway for all types of families. Impreza families can capture the fun in life while maintaining safety in all conditions. Along with the vehicle dynamics control, the car has an antilock braking system, electronic brake force distribution, and brake assist at all the necessary times. In addition, the Impreza has seven standard air bags to keep drivers and all of their passengers safe in any situation that may arise. With the 2013 Subaru Impreza, owners are able to experience a new, adventurous ride that promotes safety and efficiency rather than having to worry about the little things. The only thing to worry about now is where to go next. How to Clean your Car’s Air Filter!